Whether you a contractor or permanent designer, we all need to be able to present the scope of a project and the resources needed to stakeholders and being an expert at task analysis will help you achieve that. Let’s start by the review of what a task is. A task is a piece of work that needs to be accomplished as a part of a job. Tasks are made up of steps that need to be taken to complete the task. Sometimes these steps are a task themselves, often referred to as a subtask. The idea is to break down job tasks to their smallest components to fully understand what a person needs to understand or accomplish in order to do the job. Considering these as you interview the SME or clients for the project and listening for the answers in terms of the tasks will help make sure you probe for the information you to fully understand the scope of the project. This may not all happen in in one conversation but over time. When you are task-minded, you start by looking for an understanding of each task. This means breaking down the goals of the project to the task steps that fit the audience. By doing this you outline the full scope of the project, which helps you determine necessary resources, and helps you present this to the stakeholder or client. When you are thinking from a task perspective, it is easy to take the scope of the project and group it into like chunks that will go together. Understanding these tasks or groups of tasks, you can easily evaluate which ones are best resolved as training, what is best served with a job aid, or what can be resolved with an environmental change or other performance improvement solution. The task-analysis mindset helps you to quickly see the pieces and start to see how the solution can go together to best leverage the advantages of different types of solutions. Once you have identified the tasks and the solutions to be used, it is easy to prioritize the development process and allocate resources appropriately. If you are the sole person doing the project, you can easily determine the order that development needs to happen for the different tasks and make sure that it lays out efficiently and those pieces that could get stalled later are done first or those things that might change as the project progresses are done later so as not to do them. In a recent conversation, I was asked this question and as I reflected on it, I recognized how important it is to understand your sweet spot. These are the things which are the magic of your job, where you get the maximum impact for your effort. They feel natural, easy and have you feeling on top of the world, whether these are specific tasks or accomplishments, or they relate to the your work environment. 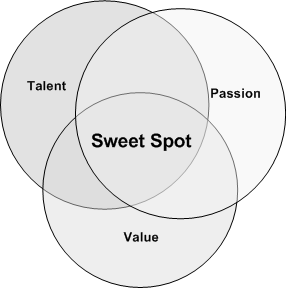 Most often you will find these at the intersection of your passion, skills, and values. Knowing what these are and making sure they are a regular part of your day will help you find joy at work as discussed in a previous post. eLearning Development – I enjoy the entire design process but for me there is something about the actual development of an eLearning module that is magical. It is the perfect blend of problem solving, artistry, and technical expertise. When I get to this part of the process, I get very focused and in the zone. I enjoy problem solving of figuring out how to make accomplish difficult interactions, and blending my expertise with the development software with an artistic eye to bring together an effective course. When I finish, I am excited to put the course in front of learners, but sad that the development phase is over. Learner’s Excitement – Nothing puts me on the mountaintop quite like talking to participants in a training session and hearing what they learned and their excitement to put it into use. As soon as I get that feedback, whatever it took to prepare and present the session, whatever challenges presented themselves, they just all melt away. Learner excitement is contagious and I love to catch it with them. As an instructional designer, I am selling new ideas, understandings, and a different way of looking at things, and when learner not only get’s it but is also excited about it, it is magic. Co-worker Connection – Have you ever had that moment in a meeting when you look at a co-worker and you can each tell exactly what the other is thinking and understand the situation with just a glance? If you have experienced that, then you probably understand another of my sweet spots. This isn’t something that happens overnight but comes from working with someone over time where both people have taken the time to know and understand the other. This typically is a symptom of a comfortable environment where sharing of ideas and asking questions is encouraged. Just being easily understood and understanding others can be the magic that takes a team or company to excellence. World/Community Impact – Some people want to individually have a huge impact on the world, but for me, I want to be a part of an organization that makes a valuable impact. This means different things to different people, but for me, there is magic when my employer is innovative and is pushing the world forward in positive directions. This could be in serving a neglected population and changing their lives, impacting whole communities with environmental/health measures or pushing forward technology to bring about new discoveries. If you have never thought about your sweet spots, I encourage you to reflect on what you do and what moments come forward as being highs. Look for the patterns in these to identify the tasks, accomplishments, and environmental factors that are a part of your magic.